This September 22, people from around the world will engage in urban activism to push for bicycle-friendly cities. Photo by Carlos Cadena Gaitan. Peaceful urban activists are setting a new trend for resilient Latin American societies. In the midst of the massive motorization caused by increased income levels, they all share one idea: we still have time to reclaim our streets – for pedestrians, for cyclists, for humans – before the car takes over completely. 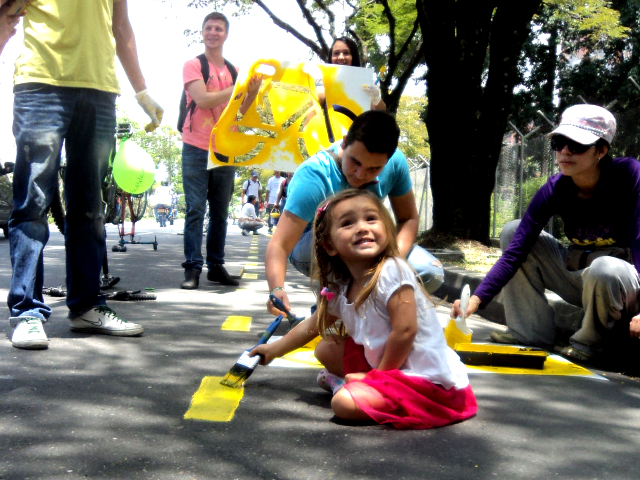 Last year, urban activists from Mexico, Colombia, and Brazil decided to act simultaneously on Global Car-Free Day, September 22nd, using art as a pragmatic tool to improve their cities. Symbolic bike paths were painted by activists. Large groups of cyclists, artists and curious citizens took back their streets from cars, allowing non-motorized modes of transport to dominate the roads for a few precious hours. Thousands of citizens were reminded of their right – and responsibility – to creatively push for more humane cities. Although it began as a symbolic action to call on local policy makers, the actions of the urban guerrillas had tangible results. Formal cycle lanes are now a reality in some of these locations, and sustainable mobility is moving quickly to the top of the political agenda in some of these cities like never before. Months later, the urban activists’ efforts were recognized with the “Cycling Visionaries” award at Velo-City Vienna. Encouraged by this positive feedback, they decided to turn “Bikes For Life” into a global event for Septamber 22, 2013. In order to allow the free participation of any group, the organizers of the event are calling on citizens to generate any symbolic action in favor of urban cycling, in their own communities. As of September 10th, 182 organizations across all 5 continents had already confirmed their participation. In Kampala, Tanzania, the African Bicycle Network is organizing a massive group ride through the streets. In Delft, a small city in the cycling country of The Netherlands, students will provide free bicycle lights to fellow cyclists. In Asunción, Paraguay, artists plan to unveil an urban monument made out of used bicycle parts. Alexandre Costa, journalist for Gazeta do Povo in Curitiba, Brazil says that “the ‘life-lines’ that citizens should paint that day can range from a simple bicycle symbolically painted on a wall to a fully-fledged bike lane along a main city road.” Zorely Ramos, one of the leaders of the event in Mexico, highlights one of the most crucial aspects of the initiative: “Anybody can provide a creative gift for their own city on that day, as long as it is done legally, and without intention to substitute the authority of the government”.